I apologize for the lack of in-depth geoscience posts lately. To be perfectly honest, I am incredibly busy right now and will be even busier in the short-term future. I really hope I can carve out some time to write quality posts but it’s not looking good. I’m not done blogging completely, but posts will almost certainly become less frequent and not as well-researched and detailed as I would like. Just a warning. The California Academy of Sciences in Golden Gate Park may not be a gigantic museum but what it lacks in quantity is more than made up for in quality. The museum (also called ‘The Academy’) recently re-opened after several years of significant renovations — so significant that it is essentially a brand new building. The new building is a marvel of the latest in energy efficiency. The Academy is now the largest public Platinum-rated building in the world, and also the world’s greenest museum. 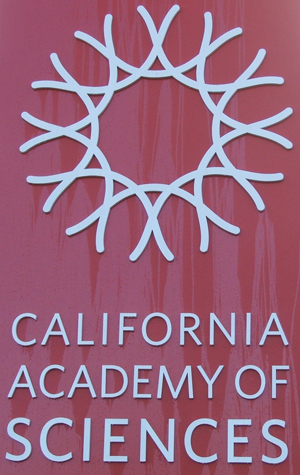 The Academy earned the platinum rating (highest rating possible) for Leadership in Energy and Environmental Design (LEED). This commitment to sustainability extends to all facets of the facility – from the bike racks and rechargeable vehicle stations outside the building to the radiant sub-floor heating inside the building to the energy-generating solar panels on top of the building! Not only does the roof have solar panels — the roof is alive! Since the Academy re-opened it has been jam-packed every weekend. My wife and I finally got a chance to check it out in late November 2008. The one thing we always do for the museums/galleries here in the area we live is to make sure to leave plenty of stuff to see next time. 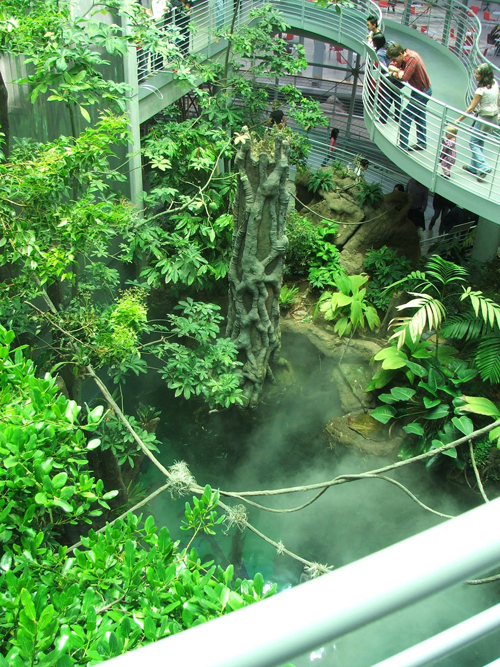 The California Academy of Sciences has two giant, four-story spheres that dominate the interior of the building — one is the planetarium and one is a rainforest. It seemed like everyone was going for the planetarium so we headed straight for the rainforest exhibit — we’ll save the planetarium for next time. The photos below are from this visit (explanations are beneath the photo). 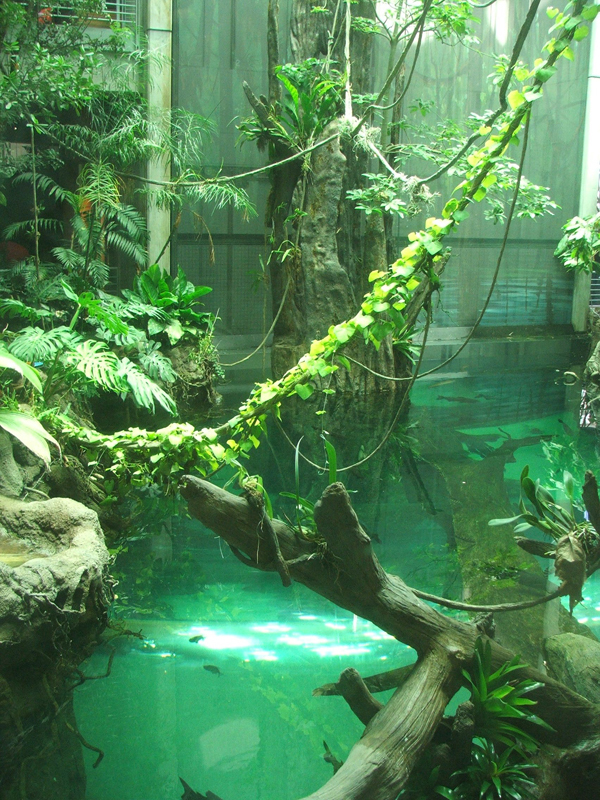 The base of the rainforest has a deep ‘pool’ with fish in it. 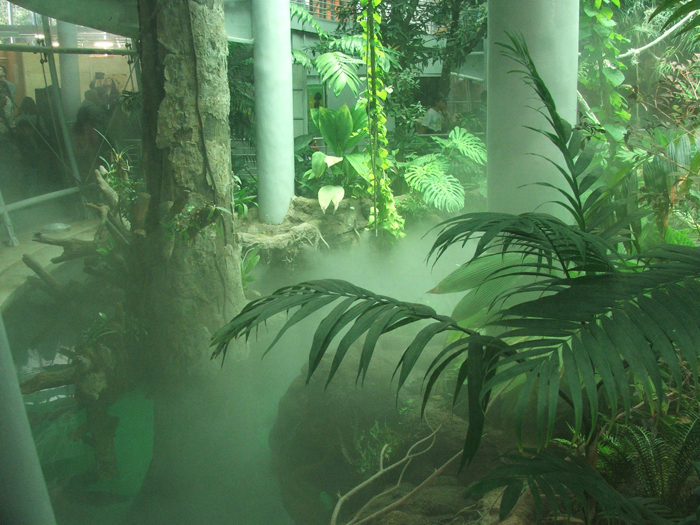 Every minute or so the mist/fog machine turns on for a few seconds — to help moisten the plants and animals. As visitors make their way up the rainforest each level has information discussing the types of animals that like to live in that part of the forest. 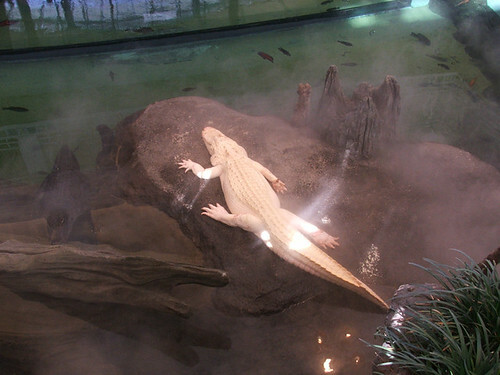 Most of the amphibians and reptiles aren’t roaming around the exhibit freely but within glass enclosures. 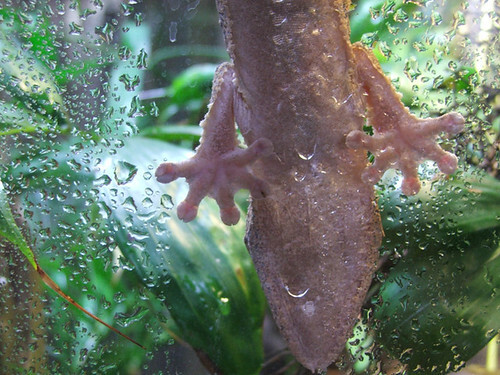 This gecko was hanging out on the glass and I couldn’t resist snapping a picture of its feet. 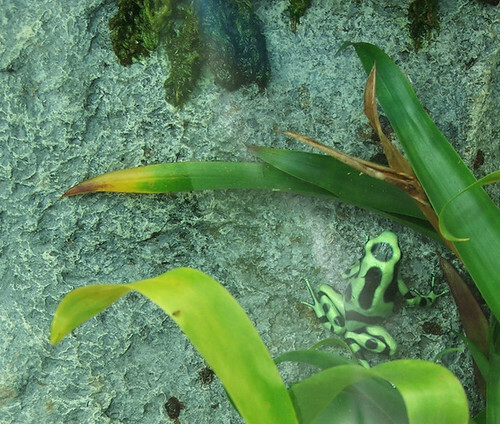 Check out the green and red frog in the lower left of the photo (if anybody knows the name of this species feel free to comment below). After checking out the rainforest, we took the elevator to the bottom floor. Just beyond the rainforest is the coral reef exhibit — and what makes this unique is that it is an actual living coral reef. 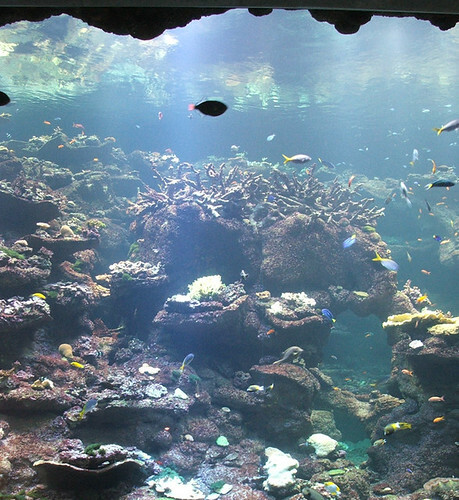 At a depth of 25 feet and holding 212,000 gallons of water, the Philippine Coral Reef is one of the deepest exhibits of live corals in the world. It houses a broad range of aquatic life from the coral reefs and mangroves of the Philippines, one of the most diverse reef systems in the world. These animals include delicate soft and hard corals, blacktip reef sharks, stingrays, and more than 2,000 colorful reef fish. We spent a lot of time in the aquarium and then checked out this pair of alligators on our way out (one of them is a lot easier to see than the other). Nice! I’ve been meaning to do a post on the Geology News blog about this for awhile. You beat me to it! Anyway, definitely a great place. I’ve been there 4 times so far! All the photos I’ve taken of the place can be seen here. That is way cool. Thanks for the great pictures! It makes me want to grow someting on top of my roof, too, but that wouldn’t work until I build a new house. The survey wasn’t of ten-year-olds, thgouh. It was of adults, all of which have forgotten some portion of their childhood education. It’s commonly assumed that people are getting stupider, because of the prevalence of surveys like this, showing just how ignorant the average American really is. As I understand it, thgouh, what little long-term trending data there is doesn’t support the idea that we’re actually getting dumber about science, but that we’re getting a better understanding of just how dumb most of us are about it. 40 years ago, if you posed three fundamental science questions to adults that any 10 year old knew 40 years ago, you’d probably get results similar to the ones above. The exact questions necessary to get those answers might vary over time (e.g. the one about humans and dinosaurs could fluctuate with the popularity of fundamentalist Christianity), but I think the average adult has always been pretty ignorant.